Cruce del Golfo - View timetables, Compare and book ferry tickets at directferries.ie. Cruce del Golfo was the first passenger ferry company to provide regular sailings across the Gulf of Fonseca, between La Union in El Salvador and Potosi on the coast of Nicaragua, in Central America. 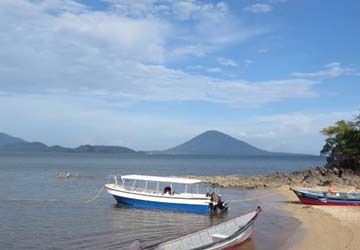 Saving you around ten hours of crossing the land border by bus, Cruce del Golfo offers a much faster route between El Salvador and Nicaragua. It’s also a far more scenic journey, taking you through the largely untraveled gulf which measures over three thousand square-kilometres, with pods of dolphins in the waters, mangroves along the coast and dramatic volcanoes diminishing on the horizon. The boat, named Stella Maris, was purpose-built in 2016 for crossing the Gulf of Fonseca, holding up to twenty eight passengers with ample room for luggage. Designed with a hard-top roof, open sides and stainless steel safety railings, it’s powered by top-of-the-range 140BHP outboard engines and equipped with GPS, radio communication and life jackets. Possessing over twenty years of experience in the maritime travel industry, the founders, captains and staff of Cruce del Golfo boast a wealth of knowledge concerning the region, including the local wildlife, weather conditions, tides and everything else required for an authentic and safe experience. View Cruce del Golfo timetables, prices and book Cruce del Golfo ferry tickets with directferries.ie. Looking for an alternative route or ferry company to fit your plans? Don’t worry, we’ll also compare Cruce del Golfo with alternative ferry companies in your search to help you choose.